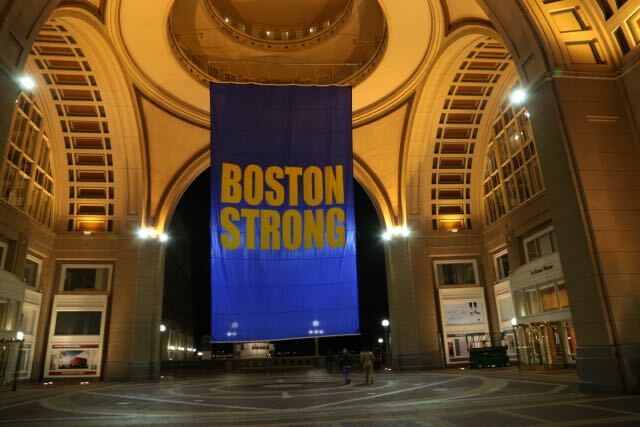 Near our hotel this huge Boston Strong flag flew. The morning of the Boston Marathon, we awoke early, but not as early as we have had to for past marathons since the race didn’t start until 9:30. Clint was the first one up and moving since he had to catch his bus and hour before I did–he was in corral one, wave one because he is so speedy. (I was in wave 3, corral 3. There were four waves and 8 corrals in all. Your placement in each wave/corral was based on your qualification time–fastest to slowest.) We were lucky enough to score a mini fridge and a microwave for our room (you have to ask for them in advance) so we used the microwave to warm our oatmeal. It looked cold and ominous outside, but it hadn’t started to rain yet, so I crossed my fingers and hoped that it would hold off. I wouldn’t have been near as nervous about the race if the predicted weather conditions had been more favorable. They were predicting rain and a 20 mph head wind. 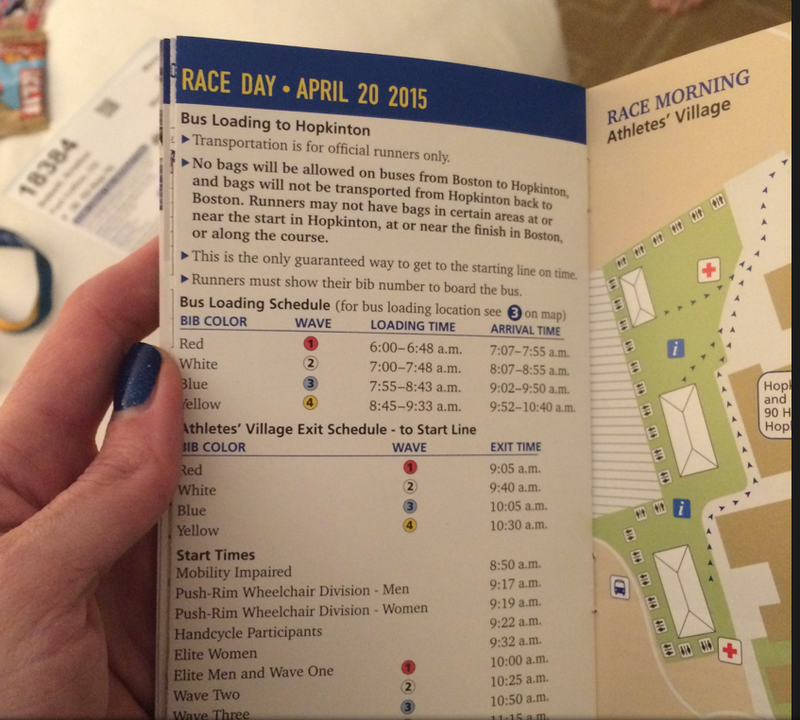 I continued to prepare for the race, tucking my cell phone in my pocket. (I typically don’t run with my cell phone, but decided to for this race so I could easily get to my family/hotel after or in case of an emergency.) I found these great Lululemon Shorts that I love for running marathons because of the two deep pockets on the sides of the shorts. They can house gels, a phone, food, a mini water bottle, and they stay put. My shorts that day had 5 gels–one for 15 minutes before and one for miles 5,10,15, and 20– my cell phone sealed in a ziplock bag, and $20 just in case I needed it. We said goodbye to Clint, and then it was my turn to start getting ready. Stephen went with me to the subway and to the gear drop off and bus loading area. Since you drop off your gear bag before you board the bus, I had on my Walmart, juvenile-section sweatshirt and pants to keep me warm until the start of the race. I had approximately 2 hours to wait outside in the cold. 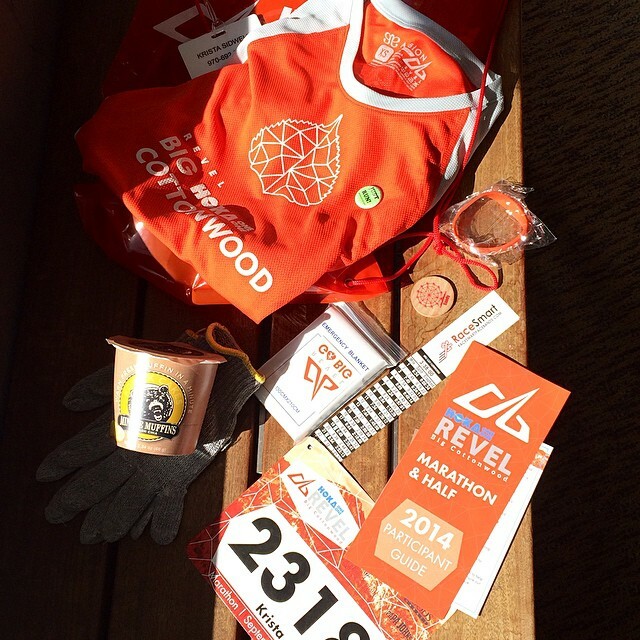 I was allowed one small clear bag–that they give you–which housed my space blanket, my bagel (for two hours before the race), a Clif bar (for an hour before the race) and a bottle of water. I ate my cup of oatmeal and orange juice back at the hotel before we left. Stephen gave me hug, took this picture and left me at the bus with my little food bag and my juvenile clothes. I felt just like a little kid on my first day of school. Sort of. I boarded the bus and sat by a cool girl a little younger than me with kids the same ages as me. She was going for a 3:40. She told me she paces by monitoring her heart rate–she just tries to keep it constant the whole time. I thought this was an interesting strategy. It takes about 45 minutes (to an hour) to get to Hopkinton so use the porta potty before you board the bus. Once we arrived at the athlete village, I wrapped my space blanket around me and headed for the porta potty lines. They had tents up and everyone was congregated under them or in the lines for the many porta potties. They had coffee stands that some athletes were visiting and the general atmosphere was one of excitement. Waiting at the starting line of my corral right before I started to run. When it was time for me to line up with my corral/wave, a guy over a loud speaker announced it. I walked up, flashing my race bib for entrance into the corral. Everywhere you looked there were volunteers helping out. About every 12 feet there was a volunteer holding a bag for you to deposit your clothing in before the race started. Along the course, but especially in the beginning, there were volunteers with bags. I wonder how many items of clothing they ended up with that day for donation. Right before we started to run, it started to rain and didn’t stop for the rest of the day. The announcer counted down the time we had before the race start and I felt the excitement start to build inside me. 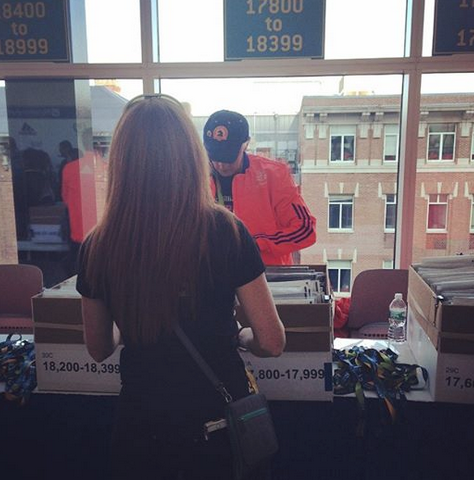 It still seemed so surreal that I was actually running the Boston Marathon. Then, we were off! I kept on my arm warmers, sweatshirt, and gloves and just discarded my sweatpants for the race start. I figured as I warmed up, I could shed the other layers on the course–this is allowed and many do it. Once my stuff was wet, I knew it wasn’t helping me so I discarded it. From what we had read, the best way to run in the rain is with as little as possible on you. You should let your body heat you. Wearing wet clothing on top of your skin only makes you colder and weighs you down. My 2015 Boston Marathon Pace band from Race Smart Bands. The first four miles were tricky because there were so many people crowded around me. 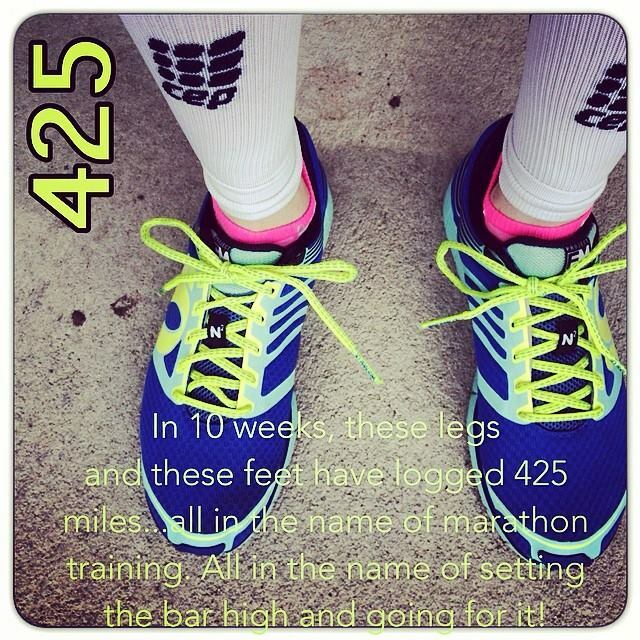 It was really hard for me to stay at my pace goal for those miles and I basically was not able to. I would try weaving in and out of people as best as I could when I would see a hole, or running on the edge of the masses, but it was really quite challenging. 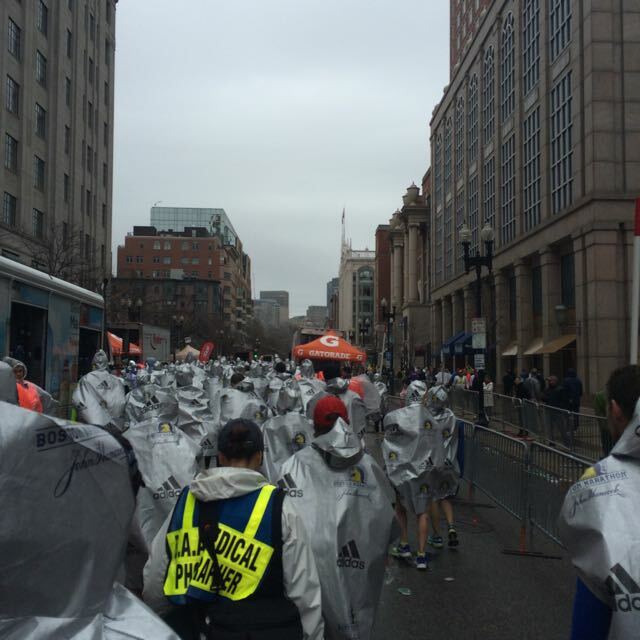 I was shocked at how many Bostonians were lining the course despite the rainy conditions. They were everywhere! And so energetic. This was the first race that I had run with spectators that lined the entire course. It was such a rush to hear them cheering the whole way to the finish. They had noisemakers, signs, candy, and outstretched hands for high fives. It was really quite an amazing thing to witness. I had read about the “scream tunnel” at mile thirteen in Wellesley, but I was not prepared for how those screaming women from Wellesley College would affect me. My eyes started to fill with tears. It really was an amazing thing to see/take part of. Half way there. Considering the constant rain, it was surprising that I actually never felt cold while I was running. The most annoying thing was that my earbuds kept falling out because of how wet I was. (Next time I need to wear a headband over them.) Around mile 16 I went to put them back in and noticed I had lost quite a bit of mobility in my fingers–it took forever to get them back in. That was when I realized I was probably colder than I realized. Just around mile 16 you start to hit the infamous Newton hills and the notorious “Heartbreak Hill.” Because we had biked the course on Friday, I knew what to expect so I wasn’t that nervous. 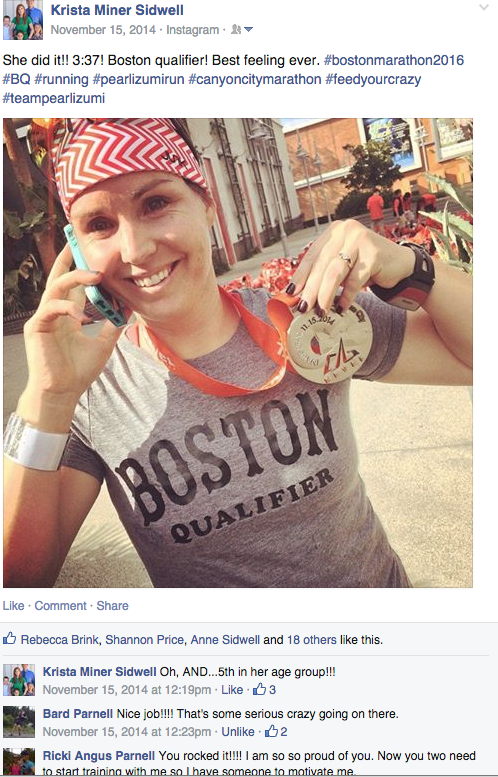 I started looking for my husband and my friend Natalie because they were supposed to be waiting at Heartbreak Hill. There were so many spectators there that I am not surprised that I never saw them and that they never saw me. 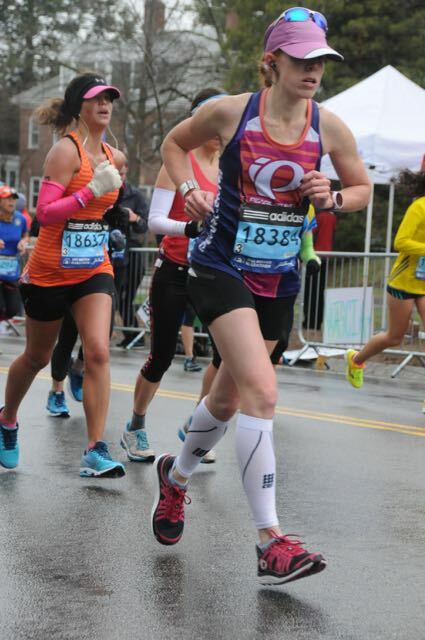 As I reached the summit of Heartbreak Hill, and still felt power in my legs, I knew that I wasn’t going to hit the wall today and I let out a big breath. There was much celebration at the top of Heartbreak Hill. It is almost as if you can feel a collective outake of air from all the athletes as the hardest part of the course is behind them. Some started dancing while they were running. Jumping. Smiles were everywhere. And the crowds? The crowds were amazing. 6 miles to go. I always try and space out when I take in gatorade and when I take in a gel to make sure I am not putting too much sugar in my system at once. Doing so can cause the nutrition to not be properly absorbed leading to cramping, bonking and other gastrointestinal issues on the course. 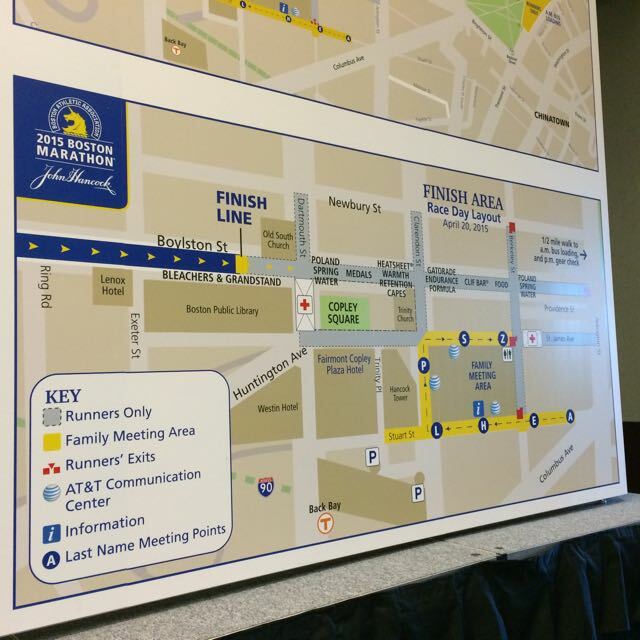 The Boston Marathon course has aid stations on both sides of the road which made it pretty easy to grab something despite the number of people surrounding you the entire race. The last three or so miles of the race were kind of a blur. I was trying to make up time for the first four miles that I was forced to run slower. There was also more wind in Boston so I was trying to draft and push against that as best as I could. I saw the finish line, and started sprinting as fast as I could. I looked down at my watch and it showed my pace at a 6:58. I crossed the finish line with a 3:30:11, right in line with my training pace, but 12 seconds shy of my goal to finish under 3:30. However, I was NOT disappointed. Given the weather conditions and wind, I felt really good about my performance. Immediately after I stopped running I started to feel the cold. My limbs started to stiffen and I started shivering violently. There were so many athletes clogging the finish line area that it took quite some time to get the heat blankets. If you click on the graphic below you will see the distances we had to traverse to get our finisher bags, medals, food, heat blankets, and ultimately meet up with family. I don’t think I have ever been so cold. Because of the continuing rain and my pre-hyperthermia state, the finish line really wasn’t as great as it could have been. I didn’t take any pictures, minus the one of all the athletes walking slowly together in their silver heat blankets–it really did look like a scene from the zombie apocalypse. All I could think about was getting warm. After seeing that the gear bag reclaim area was a half mile away, I called my husband and told him I would meet him at the family meeting area under the sign for “S”. That was a really long walk, but less than trying to make it to the gear bag area with how cold I was. When I got to “S” and didn’t see him, I called him and he said he was trying to get there but would be a while–security was pretty stringent. I told him I was going to look for cover–I was just too cold. Luckily, I found a cafe open not far from where I was and ducked inside. A handful of other athletes had done the same. I found an empty place to sit, wrapped myself in my heat blanket and just worked on getting warm. A stranger offered me a scone and a person next to me used my $20 to buy me some hot chocolate. That helped sooo much. I planted myself in that cafe and vowed I wouldn’t leave until I was found and had some warmer clothing. I waited almost an hour in that cafe. Good memories though. The Boston Marathon is like a well-oiled machine after all the years they have been doing it, but they failed that day to be prepared for the thousands of freezing athletes at the race finish. There just weren’t enough places to go and get warm. The cafe I was in had to lock its doors when they reached capacity. It would have been really nice if they had had an area like they did at the athlete village with tents and maybe some heat lamps. 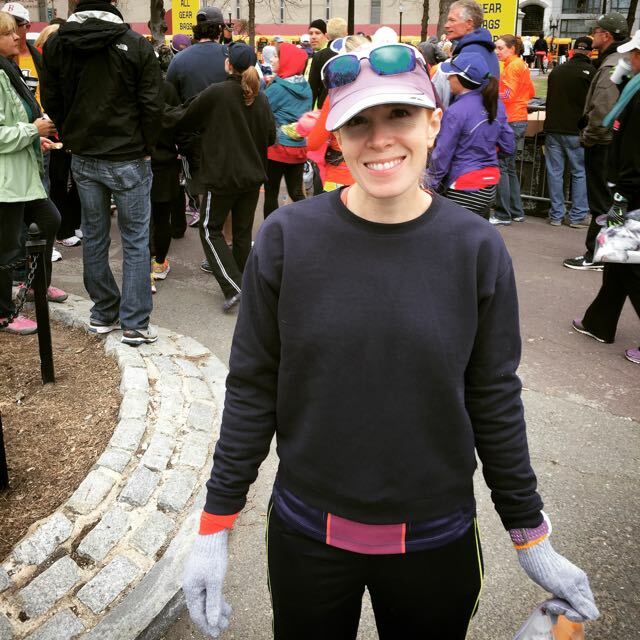 The hardest part of the Boston Marathon experience for me was that period from crossing the finish line until I got to the cafe. 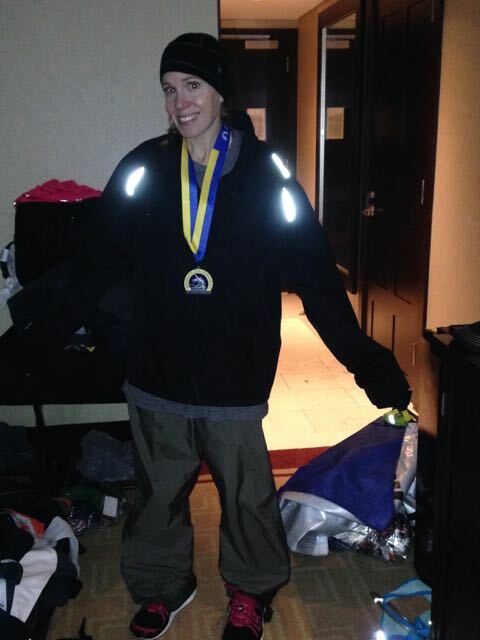 Wearing all my husband’s extra layers of clothing after completing a rainy Boston Marathon. This picture was taken right after we got back to the hotel. My husband did eventually find me and he gave me all the extra layers of clothing he had to help me be warm enough to walk for an Uber car that could get me to the hotel. He would take my race bib and go pick up my gear bag and meet me at the hotel later. I was so glad to have his support! The Modern Pastry Boston Creme Pies. Sooo delicious! We found Clint so he and I shared the Uber car back to the hotel. Natalie was in the room and had a surprise for us! She had biked, in the rain, to the Modern Pastry shop to have some post-race goodies for us! 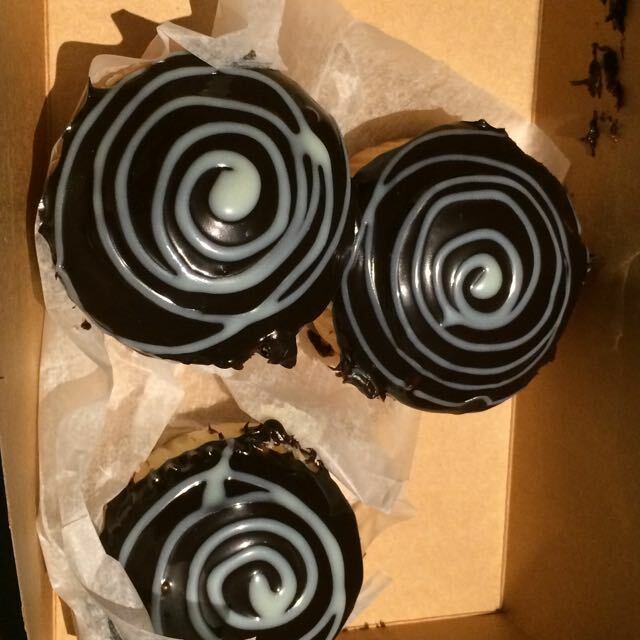 Boston Creme Pies we had been admiring for a few days from behind the glass just waiting for when the race was over! I told Clint to head for the shower first because I wanted to take a long soak in the tub to warm my frozen body and it gave me time to catch up with Natalie about the race–her perspective and mine. I will never forget sitting on the beds chatting, the room dimly lit with a couple of hotel lamps, darkened by the rain-filled sky outside and just feeling so extraordinarily happy. Such and amazing experience. Such an amazing day. It is hard to explain how you feel after you run a marathon, but there really is nothing quite like it. The body feels spent but in the best possible way. The spirit feels filled to overflowing. Anything seems possible. Everything seems clear, sharp and in focus and it lasts pretty much the whole day. 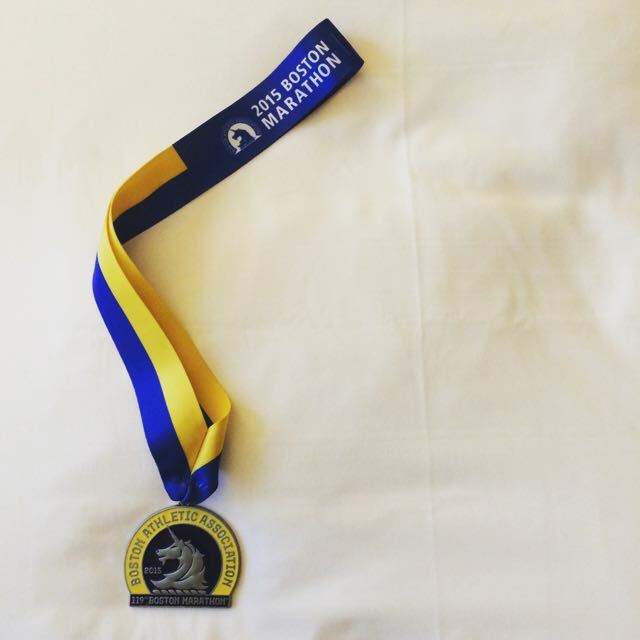 Finishing the Boston Marathon was even more sweet because of the effort it had taken to get there and because of the history surrounding such a legendary race. After Clint exited the bathroom I finally got the long, hot soak I had been dreaming about at the end of the race. Since Clint and Natalie were ready to go before us, they headed for dinner. After Stephen and I got cleaned up, we joined them to start putting back into our bodies all the calories we had taken out. A member of the Pearl Izumi team had told us that if we really hit the carbs high that night, it would really speed recovery. Quattro was our dinner of choice for that night and didn’t disappoint. By that time, we were ready to go put our feet up in the hotel and watch a show. I had a couple of tests that I had to submit online for a Medical Terminology class I was taking that were due that night so, we hit Mike’s Pastry for some treats, headed back to the hotel, and I took my tests while we relaxed with Interstellar. Cozy, warm, well-fed and content. We all slept well that night. Whether or not you ever run the Boston Marathon, I definitely encourage you to at least go watch it; go be in Boston on the day of the marathon. There is such an amazing, tangible, positive energy that permeates the air. All the Bostonians are on holiday, athletes abound, people from all over the world are seasoning the city with life. The energy in the air seems to connect everyone that it touches and for one brief day you feel like you have stumbled upon a utopia of sorts and have found yourself in a city of friends. 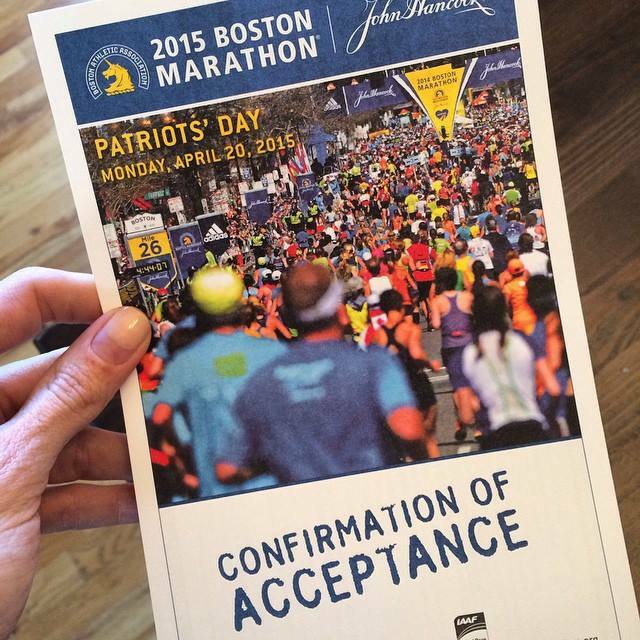 My confirmation of acceptance into the 2015 Boston Marathon. The Boston Marathon. The oldest and most prestigious marathon in the world. One of the six World Marathon Majors, it is the holy grail of races in the running world. The course runs through 26 miles of winding roads passing through eight Massachusetts cities: Hopkinton, Ashland, Framingham, Natick, Wellesley, Newton, Brookline and into the center of Boston, where the official finish line is located at Copley Square. 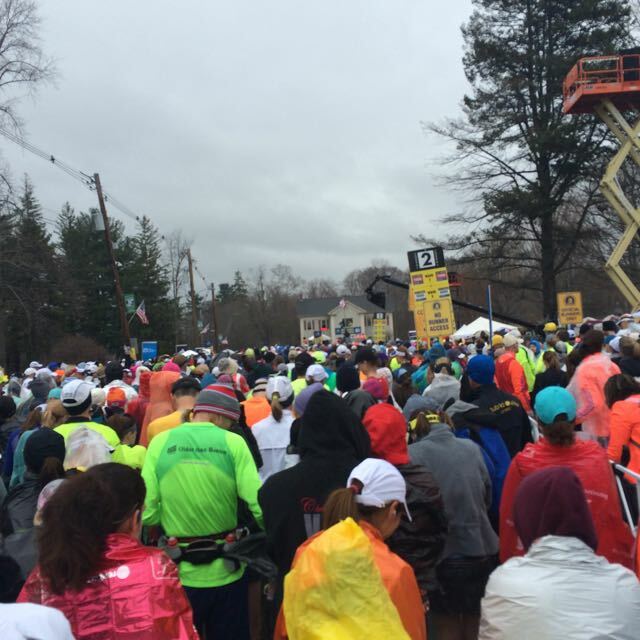 The Boston Marathon is considered to be one of the more difficult marathon courses because of the Newton hills, the famed Heartbreak hill, and the unpredictable weather conditions. Runners 18 or older from any nation, are permitted to run the Boston Marathon, but unlike most marathons they first have to complete a certified marathon course and meet the qualifying standards approximately 18 months prior to the race day they want to participate in. Even if you meet the qualifying standards, depending on the field size of the race that year and the number of applicants, you aren’t guaranteed a spot. In 2015, you had to be a minute and half under your qualifying standard to run the race. The average number of participants is around 30,000. 500,000 spectators arrive to watch the event. 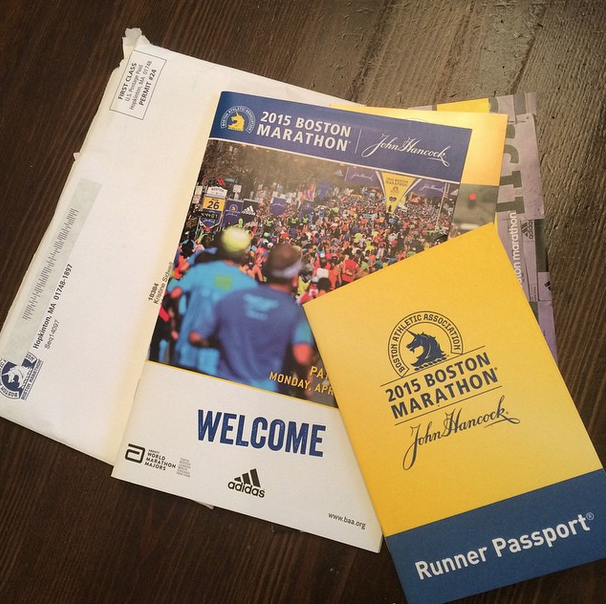 I was pretty psyched to receive my Runner Passport. I had been waiting for that Golden Ticket for a year! This event will forever be one of my favorites on the timeline of my life. 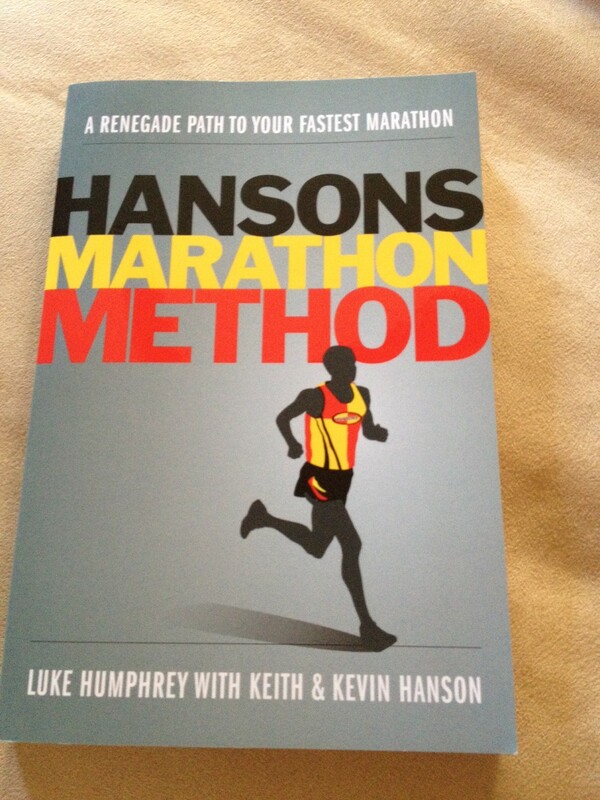 I started the Hanson Method, 18 weeks out, to prepare for a 3:30 finish time on the course. Because the race is in April, and I live in Colorado, much of my training had to be done indoors on a treadmill. As the weeks and days grew closer to Boston so did my excitement. My younger sister flew in from Utah to help watch my kids. This day was a big preparation day. My suitcase, a whopping 49 pounds, was filled with food to help me carb load the four days before the race and included my breakfast essentials for the morning of the race. My husband and I awoke at 4 am to make a 7 am flight out of Denver for Boston. This was also my official first day for carb loading for the marathon. My carry on had so much food in it, but I was prepared! 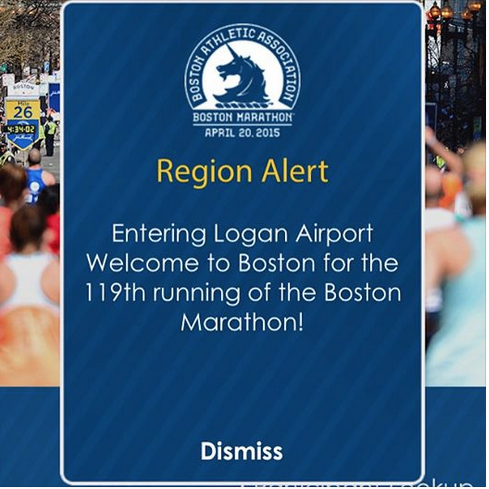 We touched down in Boston and I got a message from my Boston Marathon app welcoming me to the Boston Marathon. We grabbed a taxi and arrived at the Boston Intercontinental Hotel about 15 minutes later–the Boston Logan Airport is so close. After check in, I did a quick 5 mile recovery run and then we hit Little Italy for dinner at Al Dente and dessert at Mike’s Pastry–the infamous Florentine cannoli. Yum! Shortly after, we met up with Natalie and Clint Brown, who had come in on a later flight and joined them for dinner at Quattro–seriously delicious food. After another stop at Mike’s Pastry for some more cannoli’s, we headed back to the hotel to get some rest. 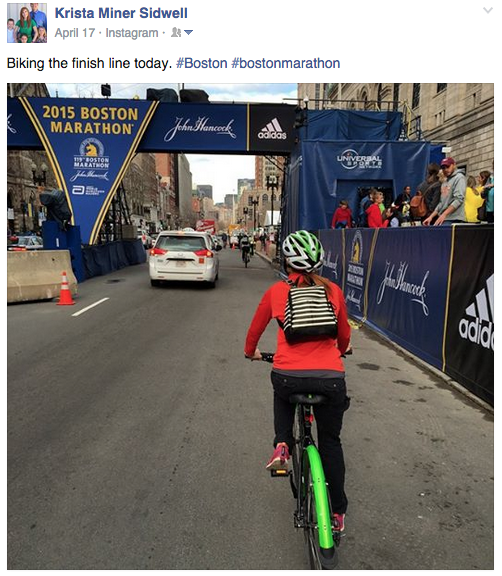 Biking 25 miles of Boston before the 2015 Boston Marathon. Before arriving in town, we had reserved bikes to tour the city on Friday morning. We awoke to rain and wished we could have cancelled our reservation with Urban AdvenTours–3/4 of a mile from the hotel, but in the end the rain didn’t really affect us that much. We rode almost 26 miles that day stopping at the Converse headquarters, touring Harvard, Harvard Square, the Harvard Bookstore, eating at Bartley’s (delicious burgers) in Cambridge for lunch, and ultimately biking to the Newton hills–our main purpose for renting the bikes. We wanted to check out what we were in for on the course. It was a really good thing we did this. It really helped us to know what to expect. (And it showed me that I really need to work on my cross training–my quads were burning biking up those four hills.) After the Utah Valley Marathon, I really wasn’t intimidated by the Newton hills. It was reassuring to see that they weren’t very long. (The Utah Valley Marathon has one mile and 2 mile hills. . . .) We left the Newton hills and biked the rest of the course all the way to the finish line area. It was fun to see all the preparations for the upcoming race. Boston was transformed from my visit a year earlier. Biking the finish line at the Boston Marathon the Friday before the event. After seriously tiring out my legs biking the city, I worried a little that I may have burned more glycogen than I should have considering I was preparing for a marathon. I silently committed to trying to not exert myself as much the rest of the trip. No need to run this day–we did all our work on the bikes! Fenway Park Red Sox game the Friday before the Boston Marathon. After biking the city we got cleaned up and tried our first experience with an Uber Car–I’ll never go in a Taxi again. 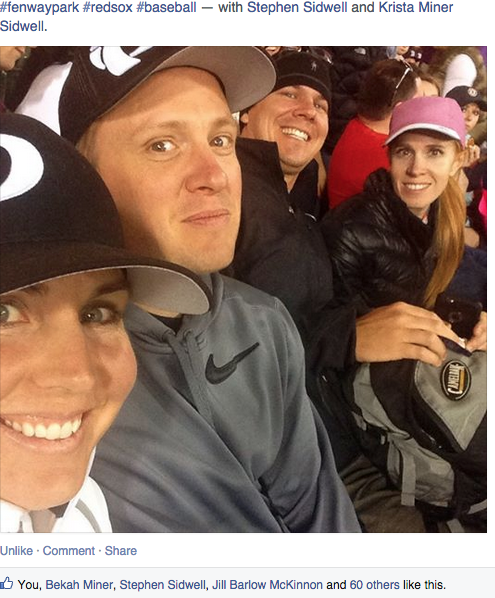 We went to Scoozi for dinner (pizza) and then headed over to Fenway Park to catch a Red Sox vs. Orioles game. I was so excited for this experience, but the crowd we were sitting by (the drunk girls that spilled beer all over me) and the distance we were from the game just really ruined it for me. We arrived home after the game and I was out the minute my head hit the pillow. 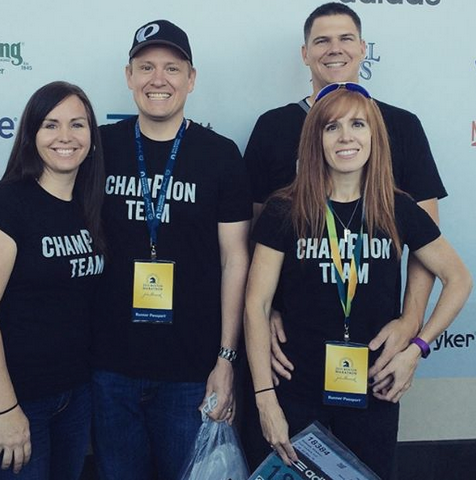 At the 2015 Boston Marathon Expo with my ‘team.’ (Natalie and Clint Brown, Stephen Sidwell, and myself. Getting my race bib. That was pretty exciting. After a lazy morning, we tried out the subway system to hit the marathon expo and get our bibs, race bags, and other race souvenirs. I knew there would be masses of people, but wow. The expo was exciting and fun, but definitely not something you need to spend too much time at. After our time at the race expo, we took our rental car up the coast to Salem, and Rockport. Salem wasn’t all that impressive. Rockport didn’t disappoint, although our Roy Moore’s Fish Shack Lobster rolls and clam chowder did. We don’t plan on renting a car when we return in 2016. We are going to spend more time just checking out Boston, but we did enjoy our little jaunt to the coast. Before we returned to the city, we took advantage of hitting a local Walmart to find some disposable clothes for race day that we could abandon on the course or shortly before. All the clothes in the women’s department were more than I wanted to spend to just throw them away, so we hit the juvenile clearance racks and I scored a sweatshirt and sweatpants for $3 each. Perfect. Upon returning from our coastal journey we decided to hit Little Italy again for dinner and man did we score this night! We stopped at a bread shop called Bricco Pannetteria and had some of the best bread of my life. It was steaming and warm which was perfect since it was cold and we were starving! We shared a homemade baguette filled with small pieces of melted cheese and prosciutto. Heaven. Then we went for our dinner reservation (I made Open Table reservations before we arrived in Boston) at Nico–my favorite meal of the trip. Stephen and I shared an artichoke and sausage rigatoni and Natalie and Clint had some of the best spaghetti with meatballs I have ever tasted! Yum. Authentic Italian just can’t be beat. They seated us in a cozy basement which was also very fun. I had no idea the restaurant even had a basement and then presto, there we were. After dinner, we went back to Mike’s Pastry for more Florentines. The athletes had descended on the city now and you saw purple marathon jackets everywhere. The line for Mike’s before dinner stretched out the door and down the street. After dinner, it wasn’t so bad so we went back for more Florentine cannolis. So delicious. 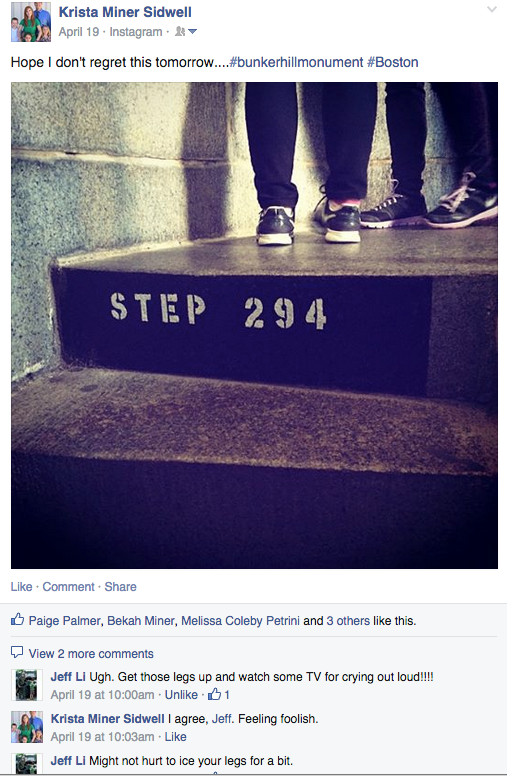 The 294 Steps up to the top of the Bunker Hill Monument. We awoke early, had breakfast (I was really counting my carbs this day) and headed to church. We still had the car so we were able to just drive there. After church, we were so close to Bunker Hill that we went and checked out the monument and foolishly paid the ticket to climb the 294 steps to the top. After that, I vowed that for the rest of the day I would get off my feet! And I did. We went back to the hotel and chilled for the rest of the afternoon until it was time to go to the Pre-Race Dinner that we had tickets to. While we were relaxing at the hotel, one of the things we did that was seriously a good idea was watching an online video of the Boston Marathon course that had commentary on what to look for and strategy tips. I am so glad I watched that the night before I raced because we weren’t able to bike the entire course and that helped me visualize it and mentally prepare. So, attending the Pre-Race Dinner….yeah, that was a seriously BAD idea. First, it was freezing, and secondly, the line stretched FOREVER to get your food from the assembly line. Seriously, I think we were in line at least 35 minutes and then we had to eat OUTSIDE. In the freezing cold. And the food was just so so. I will not ever do that again. Total waste of calories and time. After dinner, we headed back to the hotel to prepare for an early turn in. 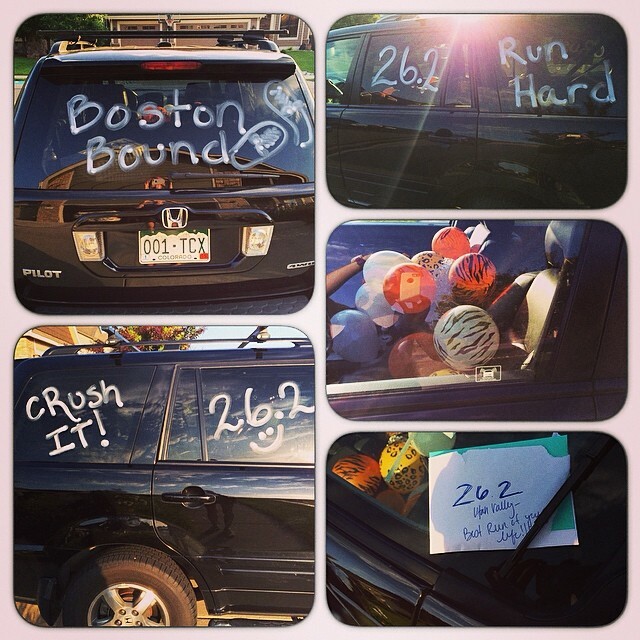 Boston Marathon eve had arrived!! 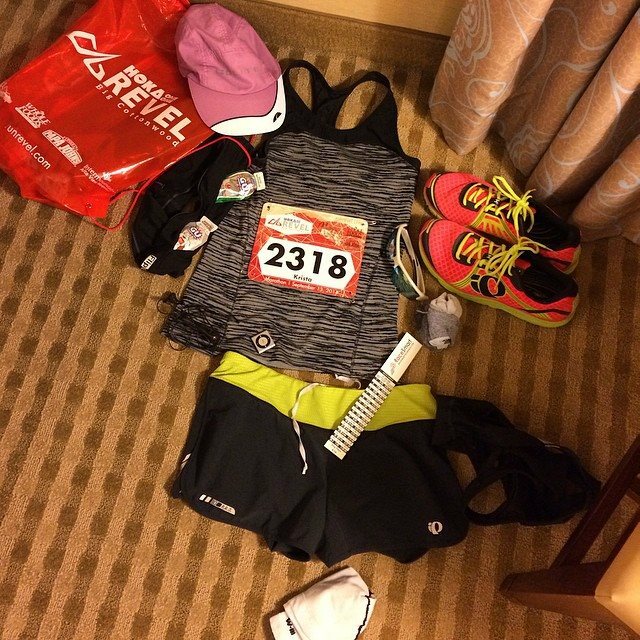 Laying out my clothes the night before the Boston Marathon. I laid out my clothes and tried to calm my nerves before one of the most anticipated days of my life! I climbed into bed, and slept fairly well–not as well as the other nights, but I didn’t really expect too. Too much excitement for the next day starting to pulse through my system. 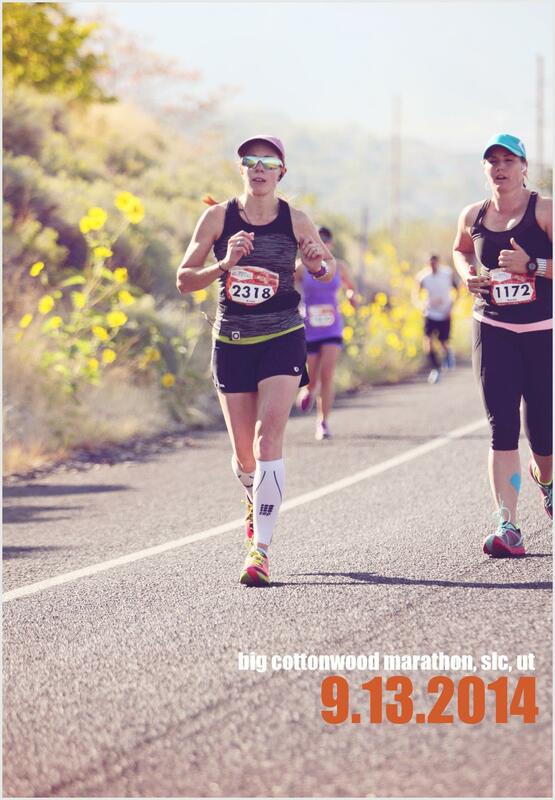 After returning home from the Big Cottonwood Marathon,I visited one of my favorite Marathon race sites, Running in the USA, to look for a good BQ marathon. 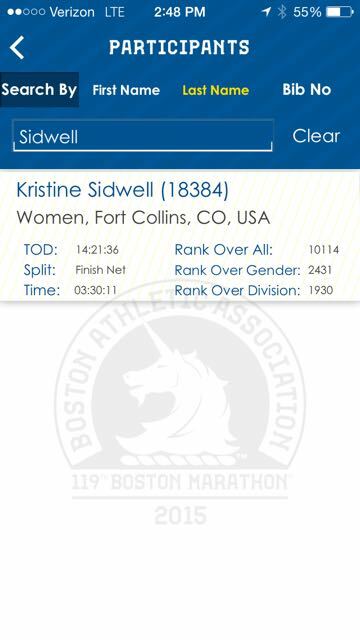 Natalie and I are an incredible team and our unlucky pacing choices on the Big Cottonwood Marathon needed to be redeemed. I wanted Natalie to know that she could BQ. I wanted her to get it. I knew she could. Like I said, she is one of the strongest women I have ever met. I happened upon the Canyon City Marathon from this site and everything I read convinced me this was our race. 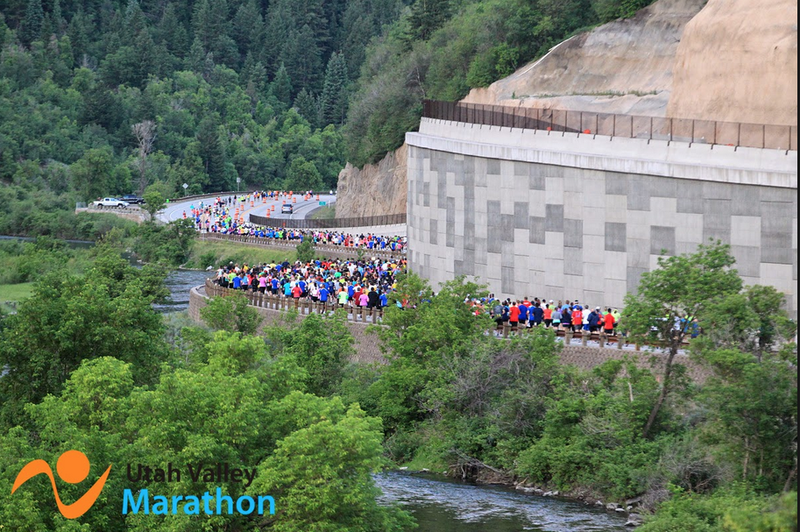 The Canyon City Marathon in 2014 was in its inaugural year. It was a Revel race which made it even more attractive to me. And check out all that downhill. Sea-level downhill. I talked with Natalie and we decided we were in. Her husband, Clint, also decided to run it. We organized a team with one other member called Team Pizza Chips and Salsa, and committed to training for the next 8 weeks. I have family that lives near Azusa and they said that we could stay with them. My cousin was actually planning on running the half marathon so it worked out perfectly. 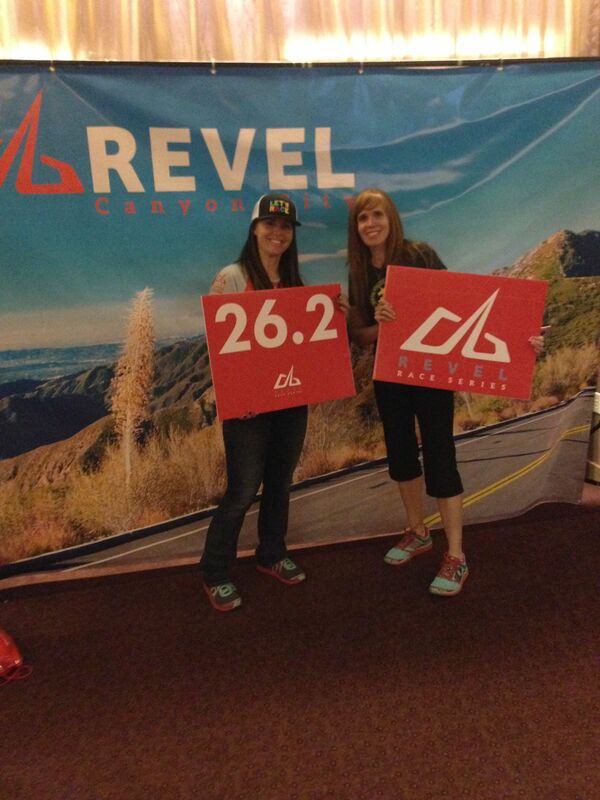 Natalie Brown and Krista Sidwell at the 2014 Canyon City Marathon Expo. We flew into LA and after a lot of time spent in traffic we arrived at the small race expo, grabbed our race materials and drove to my cousin’s home in Chino Hills. She had prepared a delicious carb-heavy dinner and we dined and chatted and then prepared for sleep. 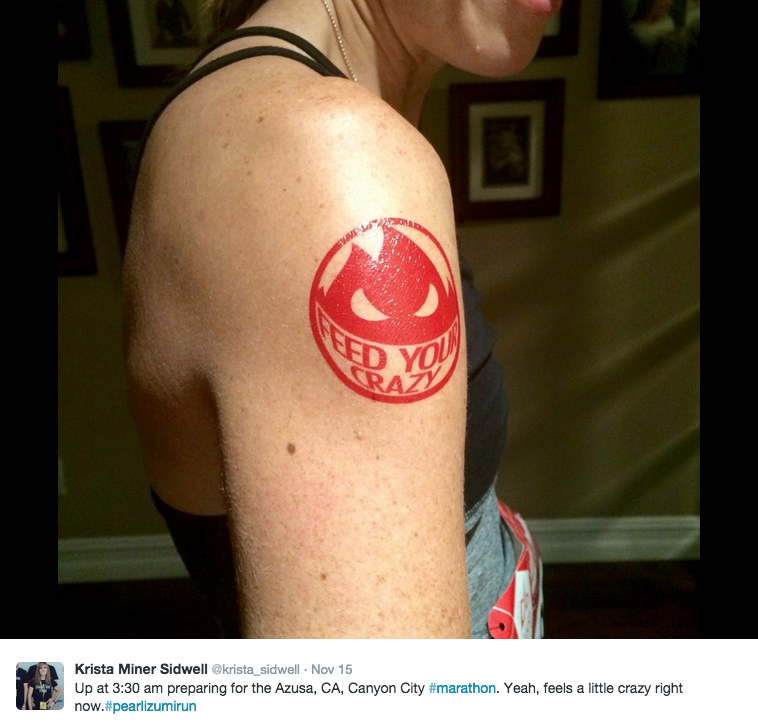 My Feed Your Crazy temporary tattoo race morning. We awoke early (3:30 am) and put on our Feed Our Crazy tattoos to show support for our friends’ business and to inspire us as much as their mission inspires us. We downed our pre-race oatmeal and jumped in a car that took us to the buses that were driving athletes up the canyon to the race start. The drive up to the race start was scenic and beautiful with soft, low-laying clouds. We were ready and at this altitude, also very encouraged by the extra red blood cells that we would have working for us from training at a higher elevation than our LA-based race. We had our pace bands, we had our pace watches and we were rock solid in our strategy for this race. We were a team to be reckoned with, Natalie and I. We didn’t panic on the hills, we didn’t go too fast on the downhill, we kept our splits and stayed focused. We even picked up another racer who wanted to pace with us. The course is so beautiful and our lungs and bodies felt great. 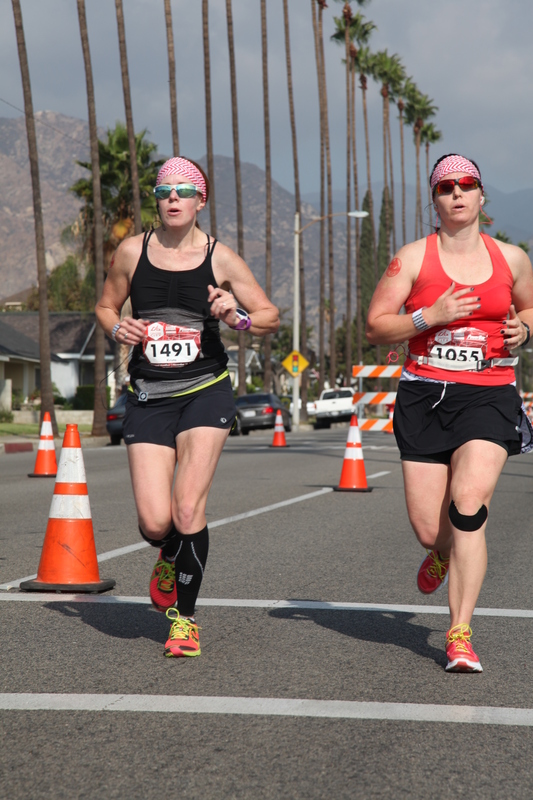 Krista Miner Sidwell and Natalie Brown in the last half mile of the 2014 Canyon City Marathon on Palm Dr. headed for the finish. As we approached the finish line, and I allowed myself to accept that we were going to pull this off, I started to feel an excitement build in me that is hard to describe. We sprinted across the finish line with a 03:37:27 BQ (8:18 pace). It is hard to put into words the emotions that I felt watching my dear friend achieve her goal. 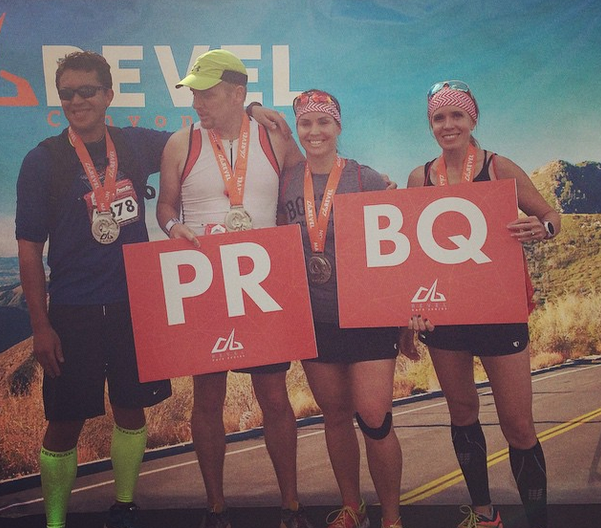 Qualifying for Boston at the Utah Valley Marathon in June earlier that year felt awesome, but this was beyond that. She was crying in her husband’s arms, who was also crying and I looked on with tears flooding my eyes. Then I got my hug! We did it! 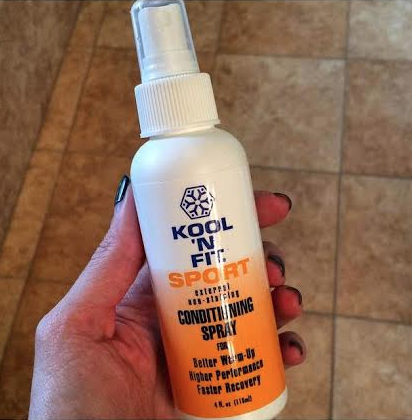 Kool ‘n Fit Sport Spray for tired/worked over muscles. The post-race facilities at this race were great. I learned about this great product: Kool ‘N Fit Sport. This stuff really helped our stiffening muscles after all that downhill that our bodies traversed. It is a must-have in my suitcase for post-race recovery now. But even with the aches and pains, there was nothing bringing us down after our amazing race. 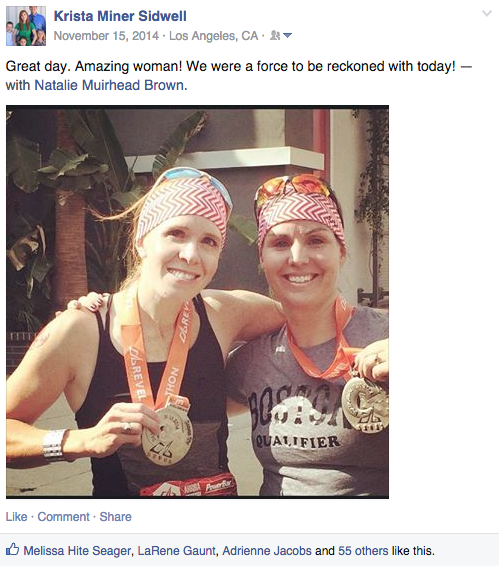 Natalie Brown sporting her BQ shirt after the 2014 Canyon City Marathon, in Azusa, CA. 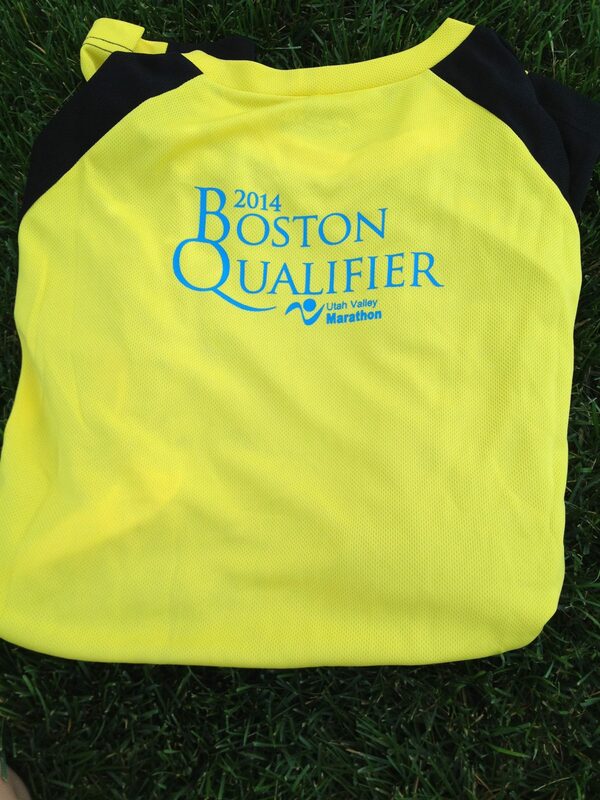 So, before the Big Cottonwood Marathon (BCM), I had a shirt made for Natalie that said “Boston Qualifier” on it. I loved the one that I received at the Utah Valley Marathon and knew that they didn’t have that perk at the BCM. I was that confident in her that we were going to make her BQ happen at the BCM. I held onto the shirt, certain that I would need it in the future for her. So, I brought the shirt with me to Canyon City and gave it to her there. Her reaction to that was great. I love this pic. 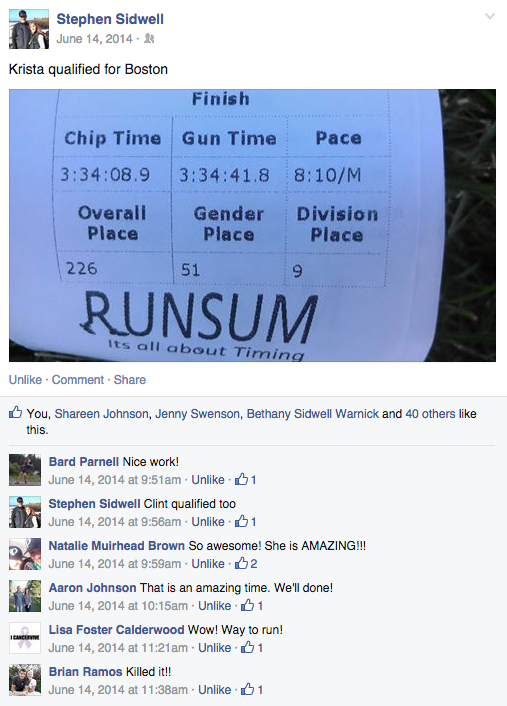 Natalie’s husband, Clint, also pulled off an impressive 3:03 at the Canyon City Marathon re-qualifying for Boston in 2016. We all qualified and we will all be running it together in 2016. 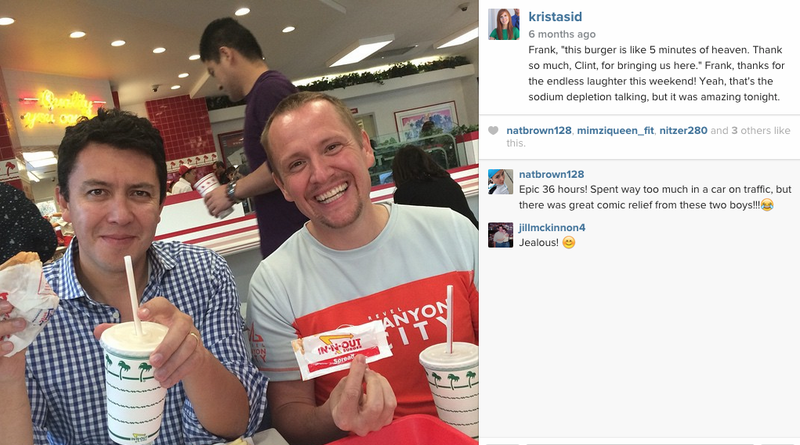 Recovery meal at In-n-Out in Azusa, CA, after our Canyon City Marathon race. 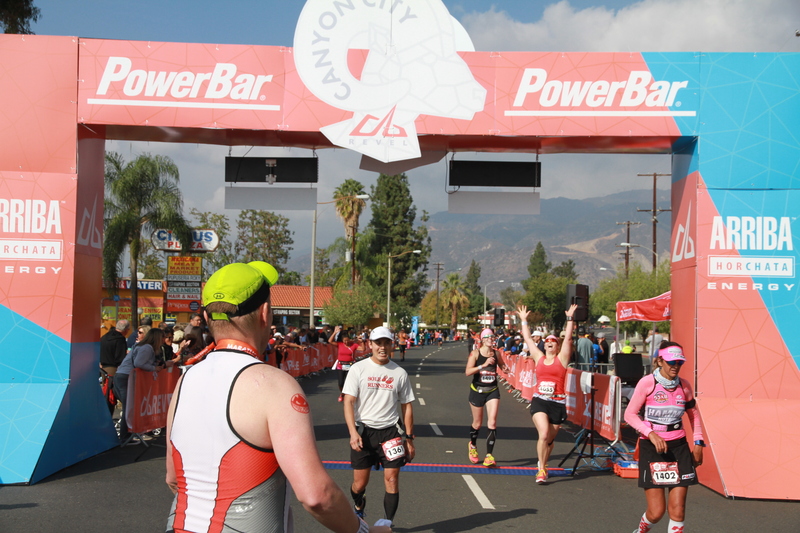 After getting our fill of the race finisher’s area, we headed back to my cousin’s house to clean up and then went for In-N-Out–one of the funniest meals I have ever witnessed thanks to our two male comedians. 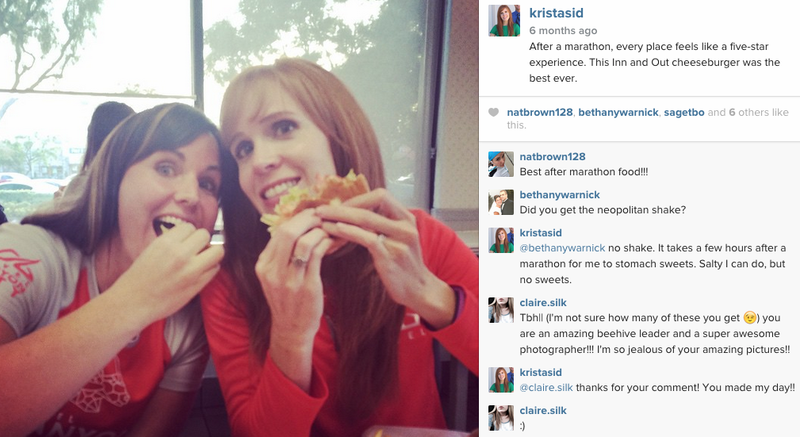 Natalie Brown and Krista Miner Sidwell in In-N-Out heaven after the 2014 Canyon City Marathon. Diddy Riese stop for some well-earned cookies in LA. 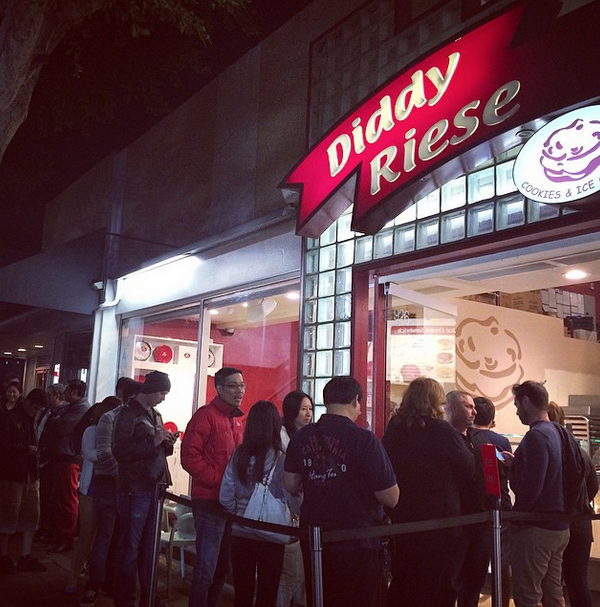 Some friends told us about a cookie place that we had to visit in LA before we caught our flight home so we braved the traffic mess and made it to Diddy Riese. Natalie Brown and Krista Miner Sidwell after the 2014 Canyon City Marathon. 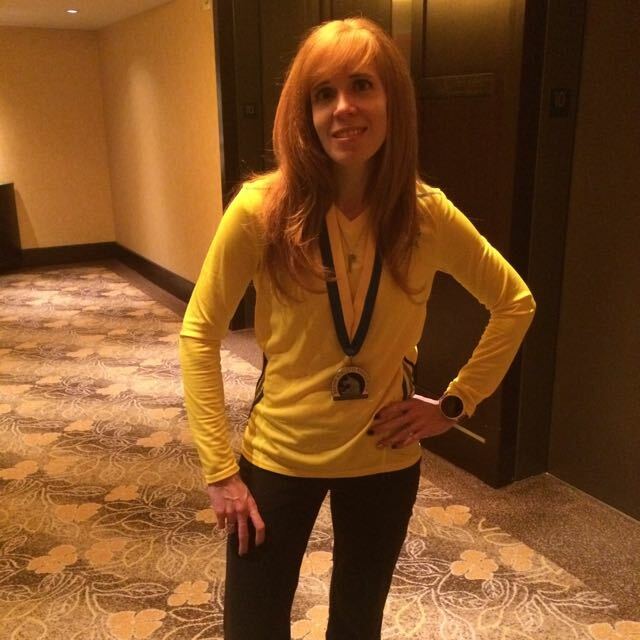 There are so many lessons to be learned from running a race; from running a marathon. There are so many parallels to life. Life tries you. It reveals you. It humbles you and at times it tears you apart. Sometimes all you can do is keep putting one foot in front of the other and will yourself not to fall. Not to stop. To just keep going. But every time you rise, every time you place one foot in front of the other, every time you choose to persevere in the face of the unfaceable, you become more. You feel more. And slowly you are able to see how much more you can do and be. You begin to see yourself and all your limitless potential and you begin to see that helping others see themselves too is better than anything else. 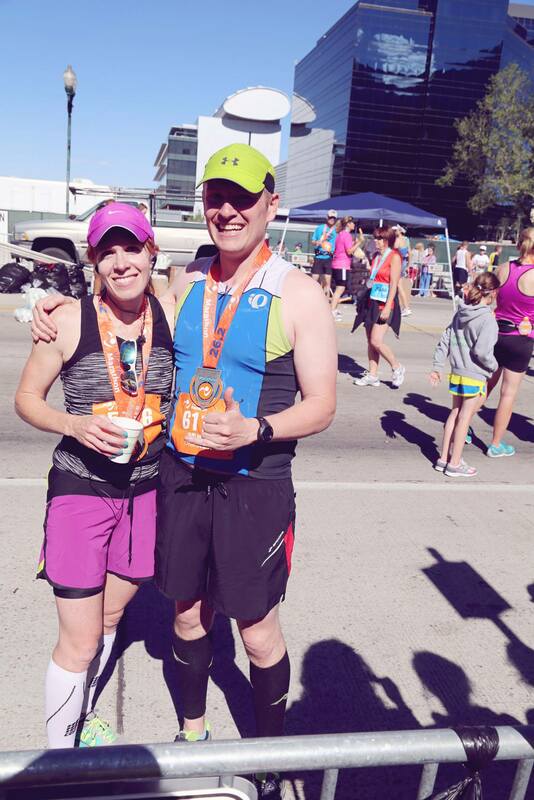 About three months after the Utah Valley Marathon, I ran the Big Cottonwood Marathon with a dear friend of mine, Natalie Brown, aka rockstar. Natalie and I started training together that summer and I was so impressed with her strength and drive. Seriously, this woman is amazing. We trained using the Hansons Method. 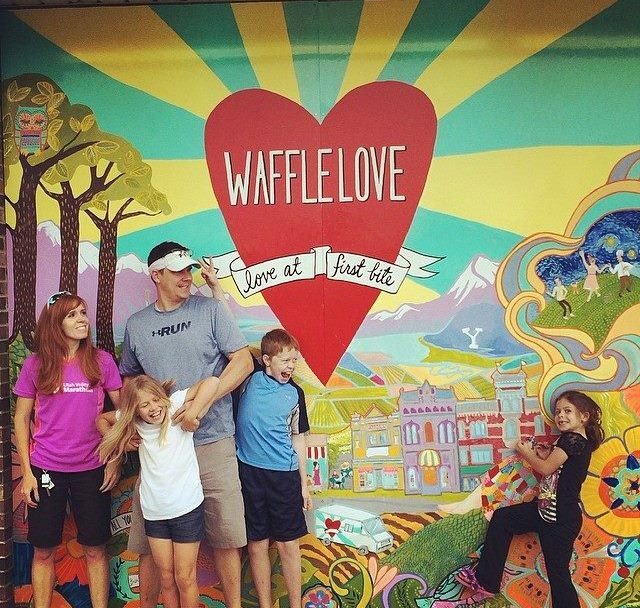 This was a new method for me but one that Natalie’s husband, Clint, had had success with. (Another post will be dedicated to talking more about this method, but I am a fan of it.) Training with someone was so much more enjoyable, and since the marathon was in September, this also meant we could do the majority of our training outside–so much more fun than running on the treadmill. Our goal time for this marathon was a 3:40 so Natalie could BQ. 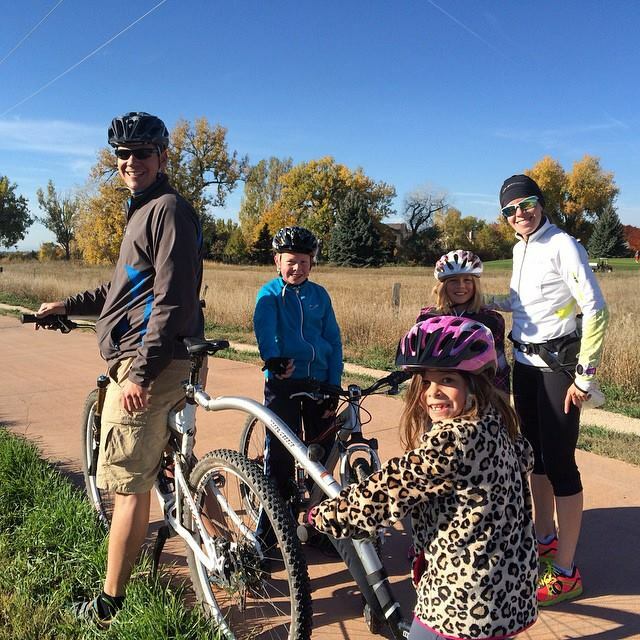 For this race, I flew in from Denver and my husband stayed back with the kids. (Thanks, Stephen!) I stayed one night, (Friday) and then came back on Saturday after the race was over. 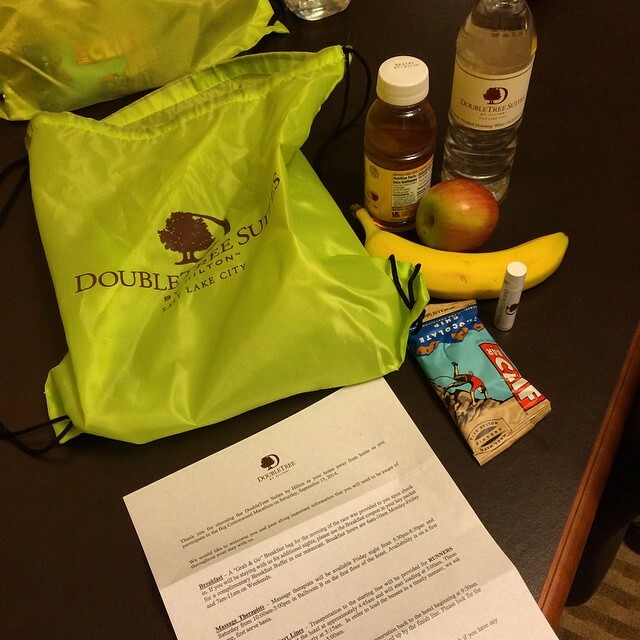 I arrived into the SLC airport and was picked up by my hotel’s shuttle–we stayed at the Doubletree Suites in Salt Lake–one of the recommended hotels for this race. (This hotel was great for the race, except it was too far from the finish line. That is the only reason we won’t be staying there for the race this year. ) 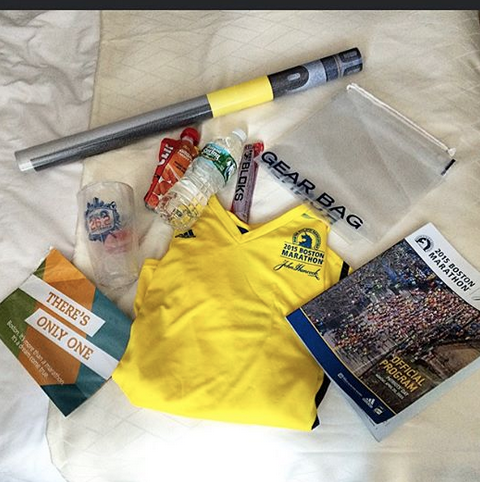 Upon check in, they gave me a complimentary bag they had put together for marathoners that included race day information and food–see pic. After getting settled into the hotel, I walked a block to get on the FrontRunner train which took me straight to the expo–it was really slick. 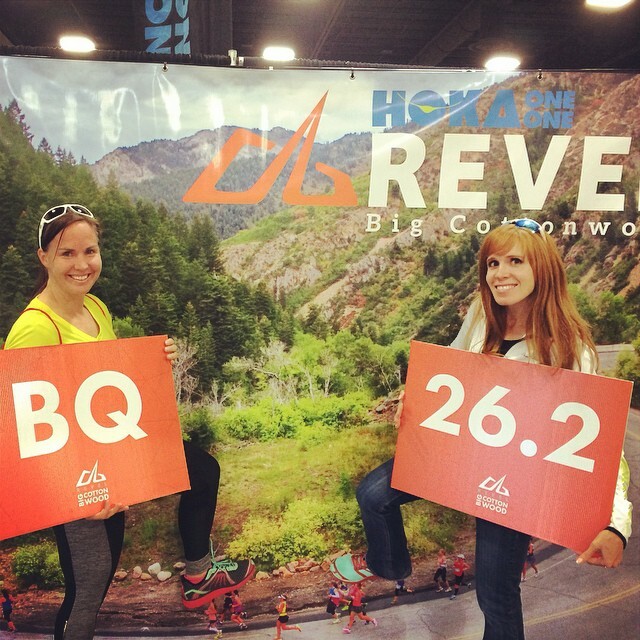 Natalie Brown and Krista Miner Sidwell at the 2014 Big Cottonwood Marathon Race Expo in Salt Lake City, Utah. The expo was really well-organized. I hung out there for a couple hours while I waited for Natalie and Clint to drive in from Colorado and then we got our race bags and bibs and headed to the hotel. Our race bags for this race were great. (Revel, in general, puts on really great races. Great expos and race bags, free photos, refundable entries if you need to cancel, organized courses, expansive finisher’s areas with free massages, nice-quality medals and shirts etc.) The mylar blanket, gloves, bracelet, and kodiak oatmeal set this race bag high above your average bag. After the expo, we grabbed some food at Noodles and Company (Penne Rosa–mild and some flatbread) and then took some time to drive part of the course. We mainly wanted to study the out-and-back section and from there to the finish line. 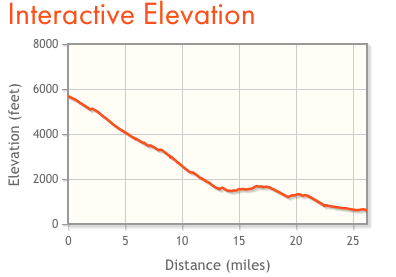 The out-and-back looked a little hilly but we were still feeling confident in our preparation for the course. We prepared for bed, laying out all of our items and getting our food ready for our early wake-up call and then hit the pillows. It is sooo much more fun to be running a race with a friend. We had trained together and had the same goals. We had the same hopes and the same fears. We were in this together. Unlike the Zermatt hotel, for the Utah Valley Marathon the June prior, this hotel was extremely quiet, and had a microwave. I slept very soundly. We woke up, prepared, ate our oatmeal and juice, grabbed our bagels and were ready to go downstairs and catch the shuttle. Race mornings are such a mixture of nerves, excitement, fear and adrenalin. You always wonder what this race will be like. Will all the training pay off? Will the weather cooperate? Will it be windy? Will you have to use the bathroom? Will your body perform? Will you pace it correctly? Will you hit the wall? Will you make your goal? Did you carb load enough? Did you get enough water? Will you get sick? Did you eat well the night before? Did your food digest well? All these questions run through your head. Every marathon is different and this was a completely new course for both of us. After the 30-mile ride from the hotel to the race start we began the routine of cycling through the porta potty line and trying to stay warm. The space blanket helped a ton. You get to a point in all the waiting that all you want to do is start running. We talked to the different pacers and tried to decide if we wanted to stick with the 3:40 group, or pace a 3:38 ourselves–to give us some cushion. In the end, we decided to start off with the 3:40 group, but look at our pace bands/watches and decide if we needed to break off from them or not. Even at mile 16 we still felt great. It was after mile 16 that we started the out-and-back portion of the race and then things weren’t so great. The grade on the hills felt much steeper than when we had driven this portion of the race. We started to slow down, but because of all our negative splits in the first 16 miles, we were still okay even easing up on our pace. From mile 22 to 26 you have a slight downhill grade. It was quite a relief to hit it after the long 6-mile out-and back, but even with that we weren’t able to make up the time we had lost. We saw the pacer go by us with his 3:40 sign and we kept trying to catch him, but just couldn’t make it happen. However, he was still in sight and I knew that we had started after him. Our chip time, and my pace watch told me we were still under 3:40. That is when I started to get loud. Really loud. (Probably really annoying.) I did not want Natalie to give up. We were so close, I knew if we pushed just a little harder she could do it. Natalie was amazing. I have never seen such determination. She was hurting, but she was pushing herself so hard. We crossed the line 40 seconds shy of our goal and finished with a 3:40:40. 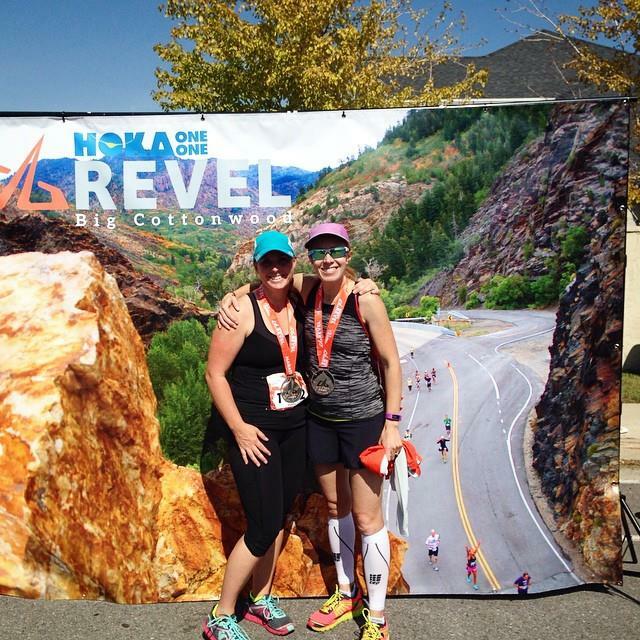 Natalie Brown and Krista Miner Sidwell at the 2014 Big Cottonwood Marathon finish line. That was an emotional ending. She deserved to BQ. She definitely had earned it. She had been so close. I was sad for her that she hadn’t gotten her BQ, but at the same time, I was so incredibly happy for what she had just done! What she had accomplished. In just 18 weeks of training, she had taken more than an hour off her time. 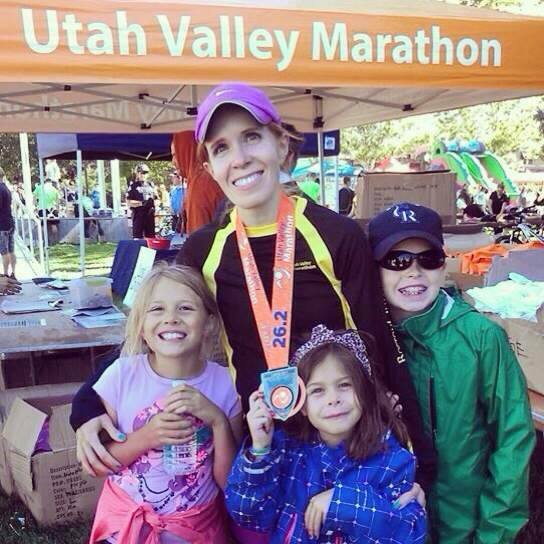 She had gone from a 10:28 pace at the Salt Lake Marathon to an 8:25 five months later! Like I said, this lady is a rockstar. We hit the massage tables, then headed back to the hotel to get cleaned up and grab some Inn and Out Burgers and fries. (It takes me a few hours before I want to eat anything after a race. Water is always great, and I try to at least take in the chocolate milk they offer at the finish line for muscle recovery, but I usually just don’t have an appetite. Then even when my appetite returns, the last thing I want is anything sweet for several hours–probably due to all the simple sugars from the gels that I take during the race. Salty foods are definitely desirable. I assume that has to do with sodium depletion from sweating.) A juicy burger and salty fries a few hours after a marathon taste so good. Natalie and Clint drove me to the airport and I was on my way back home. It was fun to see so many other marathoners at the airport sporting their racing jerseys. Like me, they had only flown in for the race and then were headed back to their homes. All I could think about on the way home was conquering that course in 2015 and what race Natalie and I could do together immediately to leverage all her training and to get her the BQ she earned! That story continues with the Canyon City Marathon. Stay at a race-affiliated hotel close to the finish line. Check the marathon website for hotels they recommend. Not only will this get you a discount, but they usually also provide you with a shuttle to the race start and a bagged breakfast. Book early, because they fill up fast! Even if you have family in town you can stay with, if you are traveling with your kids, it is helpful to get a hotel room for the night before the race just for you, you and your spouse/friend/fellow racer. You need a good night’s sleep with no distractions. Don’t rely on a pacer if you have an aggressive goal. Get a pace band and a reliable pace watch and pace yourself. Sometimes you get a good pacer and sometimes you don’t. Talk to the pacers before and ask what their race strategy/splits are. If they are in line with yours start with them, but if they aren’t staying with the goals you have or with your pace band splits cut them loose. Don’t bank time. This is NOT a race you want to bank time on. 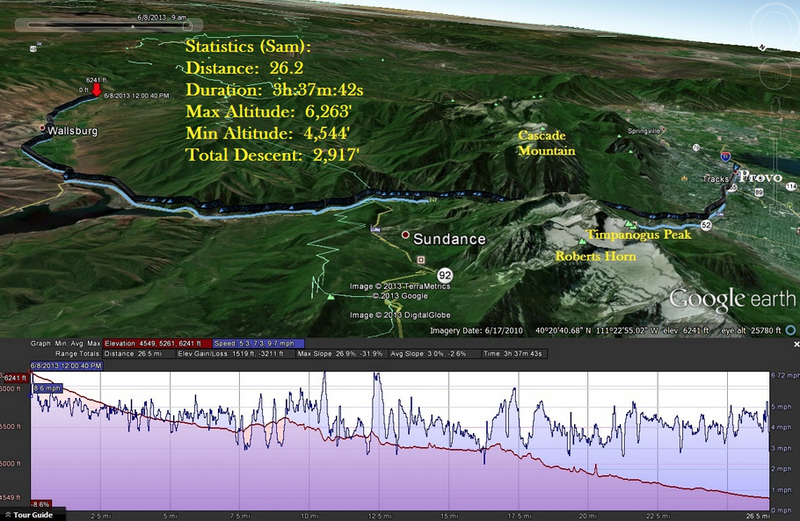 They changed the course for 2015, so there is now 18 miles of downhill as opposed to 16. This should help the overall experience because now the out-and-back section will be shorter, BUT you have to be careful not to go too fast on those fast, downhill miles. It will feel easy at first, but you will pay for it later. Instead, try and stay at an even pace. Keep your splits even. Conserve in the beginning and if you have more juice after mile 23, then you can pick it up. Train for downhill. For the first 16 miles of this course you are descending at a 5 percent grade. If you haven’t trained for that, you are going to feel that during the last 10 miles of the race. You lose about 2800 feet through the course of this marathon. Train for it! Mentally Prepare for the Out-and-Back. 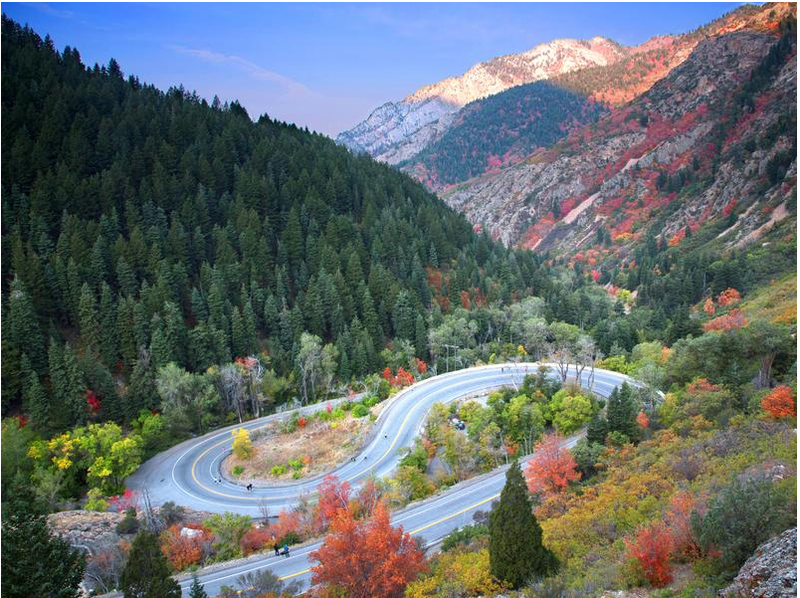 Once you exit the canyon–at about mile 18.25, you will begin a 4.25 mile out-and-back on Wasatch Boulevard to the edge of the Old Mill Golf Course. They shortened this section of the race this year (starting you higher above Guardsman Pass) but you still have 4.25 miles that you have to run on this hilly, mundane part of the course. Prepare for this in your training–both physically and mentally with visualization techniques. 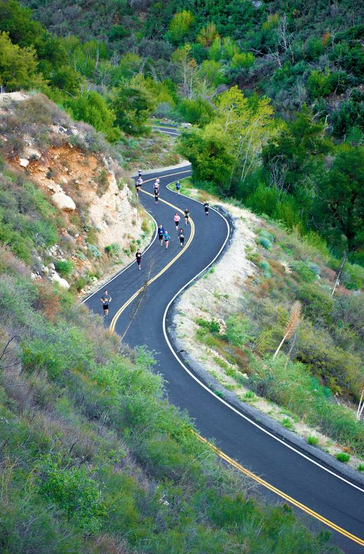 Prepare for this when you are running the 18 miles before this section–conserve. Be strategic. This is the hardest part of the course, but definitely conquerable. Pack your Space Blankets. You wouldn’t think you would need them in September, but up in the canyon at 5:00 am it is cold. 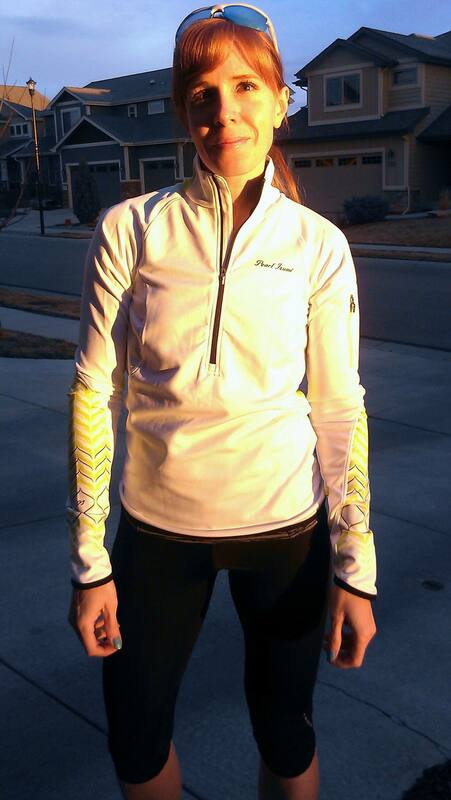 Wearing my new Pearl Izumi gear shortly after I joined the team. While training for the Utah Valley Marathon, I learned about Team Pearl Izumi–a community of athletes that were dedicated to fitness/wellness, who pushed themselves together to new heights and achievements, and by so doing, inspired others in the process to do the same. A friend of mine had been selected for the team earlier that year and what she had to say about the team intrigued me. 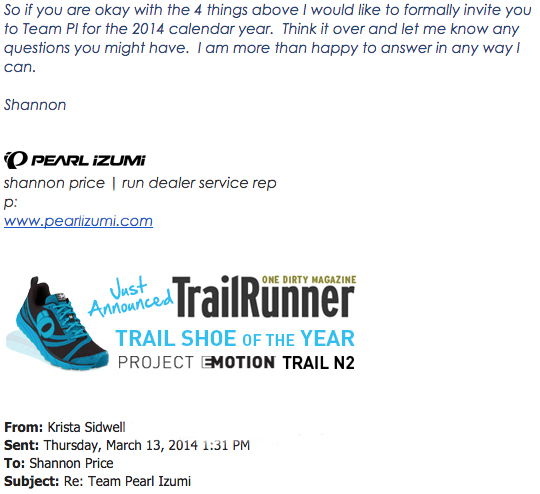 I went onto the Pearl Izumi website, found a contact email and asked how I could learn more about the team and apply. Acceptance letter for 2014 Team Pearl Izumi. shoes in graphic to the left). After logging 425 miles of runs in 10 weeks of training, it was time to put it all to the test. I knew I had put in the work to accomplish my goal, but I was concerned because in all my runs above 20 miles, I had hit “the wall.” Mile 22 was especially problematic for me. If that happened to me during my race, my goal of qualifying for Boston at this race would not happen. 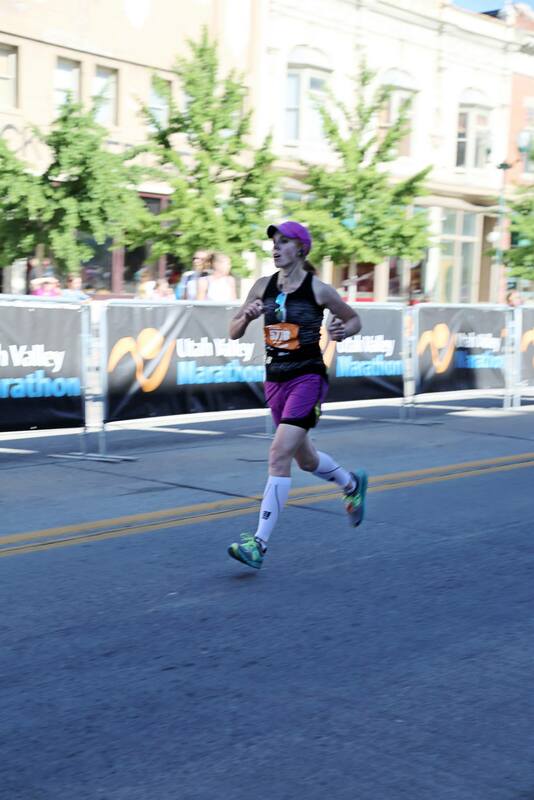 My story continues with: The Utah Valley Marathon. 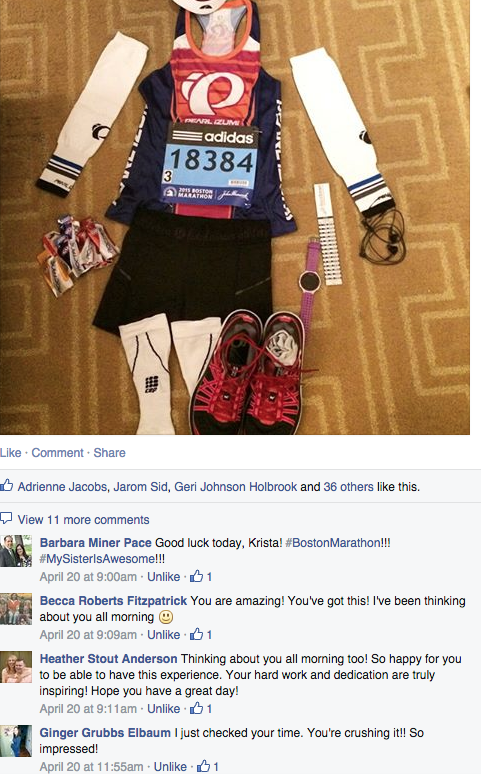 In late 2013, some friends of mine told me they were going to try and qualify for the Boston Marathon. At that time, the fastest I had run a half marathon was a 1:57, or around a 8:50 minute per mile pace, at the Canyonlands Half Marathon, in Moab, Utah. 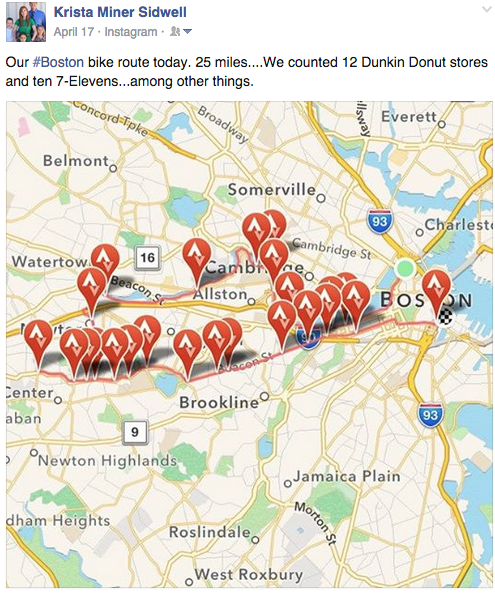 The energy of my friends for Boston inspired me and I decided I would make a go for it as well. Back then, I wanted to run two marathons–one to qualify me for Boston, and then Boston and be done. Even with three half-marathons under my belt, I still wouldn’t have called myself a long-distance runner then. Training was hard. I did the majority of it on the treadmill because of intimidating winter weather conditions in Northern Colorado where I live. During those 21 weeks training, I was in the doctor’s office three times for injuries–tendonitis (in both ankles) and shin splints. I ran in foot braces, for a while and even had periods where I couldn’t run at all. 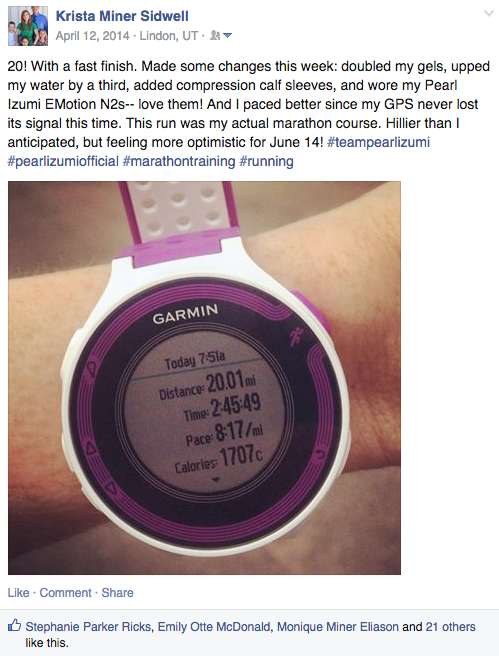 My story continues with my entry: Team Pearl Izumi.